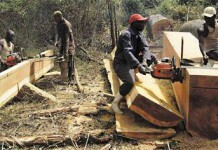 Everyone who saws his or her own timber gets amazed by the same thing: Rough logs turning into smooth boards. The designer Anton Alvarez captured the magical moment in a bench, which was shown during the London Design Week at the end of September. Anton Alvarez is from Sweden. 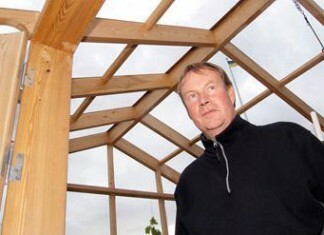 During his education he used a Big Mill from Logosol to create unconventional furniture. The first tries whetted the appetite. 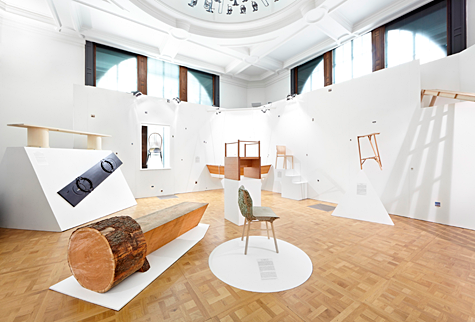 When he continued his studies at the venerable university Royal College of Art in London, he got the opportunity to develop his idea of sawing furniture. The assignment came from the American Hardwood Export Council. This organisation works for an increased use of American hardwood. Through the project “Out of the Woods” graduating students in product design got the task to create environmentally friendly furniture from a life-cycle perspective. It was not enough that the furniture was made of a sustainable material. The design had to feel applicable well into the future to avoid that fully functional products are scrapped when the trends change. The idea was that he would do it in the USA, on the spot where the tree had been felled, and that the result would then be transported to the exhibition in London. But instead an unbarked log of American cherry wood was sent to London. “The cherry trees that grow here in Europe are just like thin sticks compared to this. 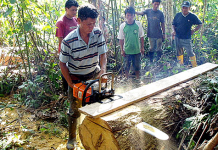 I would very much like to see a forest of large-diameter cherry trees,” says Anton Alvarez. The aim was to create a sharp contrast between the rough bark and a perfectly sawn surface. This is the opposite of the aesthetics behind sculpting with a chainsaw, which gives coarse surfaces with about the same sensation that you get from bark. He was trying to capture the feeling every sawyer experiences when they lift off the slab after the first cut and are met by a perfectly sawn surface. 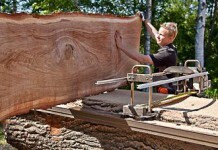 The bench was cut out with great precision, also this time with a Big Mill. Half the log became a seat in the shape of a perfectly sawn triangle. On the other half the bark was left on. It became a meeting between nature and design, between the crude and the refined. “The chain gives a fine and exciting surface that isn’t planed,” says Anton. The bench attracted much attention during the design week in London. It stood out among the twelve pieces of furniture that were produced during the project. 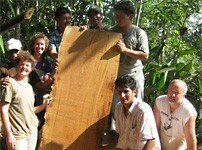 American Hardwood Export Council is planning to exhibit the twelve contributions in other places in the world. For his own, Anton Alvarez hopes to get a commission of a more steady nature. 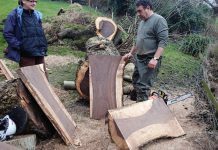 “The dream would be to produce furniture that are placed where the trees have been felled, as a part of nature,” he says. Right now, he devotes himself to another project, which will be shown during this autumn at an exhibition about Swedish design in Tokyo. He has created a method for putting furniture components together. 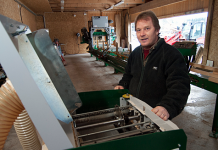 Instead of screws and pins he has designed a machine that binds the components together with thin wires. More about this is found on his website www.antonalvarez.com.